Denon published a series of apps using our existing audio modules. Top notch quality. The coolest DJ software, made in cooperation with DJ-Tech and Deckadance. Dedicated software for the Masterlink live 24, a 24-channel mixer with dock for iPad. Since the introduction of the first iPhone, Elephantcandy has been one of the main/most successful audio technology licensors in the mobile audio software business. We deliver straightforward API definitions and outstanding quality in design, functionality and sound. We like to keep our customers happy and offer fast and efficient customer support. Want to know more about licensing? Contact us. Elephantcandy has extensive experience in the development of mobile audio apps. Whether you want to build an app from scratch or need assistance with just the complex (audio) bits, our team of expert developers and designers is ready to help you out. Over the years, we have worked with companies in industries including Music, Film, TV & Radio Broadcast, Corporate A/V, Consumer Electronics, and Telecommunications. 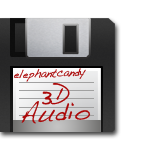 Save both time and money when you develop your mobile applications with elephantcandy’s audio technology. These modules are available for integration into your software. Add space to your sound with reverb and delay, enhance it with high-quality compression and equalization and transform it with our effects. Our processing modules sound great, can be controlled in realtime and their efficient implementation means they can be freely combined, even on low-powered devices. Sound Enhancement is a ready to plug in suite of tools to enhance audio playback based on studio quality recording effects and techniques. State of the art algorithms form the base for elephantcandy’s delay, reverb, compressor and limiter all in one package. Whereas conventional equalizers allow you to amplify or attenuate predefined bands, with EQu you can design an extremely precise and smooth frequency response by directly manipulating more than 1000 discrete bands. EQu’s linear phase design also preserves all of your music’s fidelity and introduces no spatial distortion. We also have parametric and time domain based filter equalizing. Please contact us for more information. Singing along with the latest music hits or your favorite artist is a lot of fun. Elephantcandy’s Karaoke Module makes this easy. While the lyrics scroll by, to mix your voice with the music, save it and share it via social networks. And even your voice will sound great! The module, designed for consumer voice recordings, includes several voice enhancement tools like reverb, delay and rumble noise reduction. Elephantcandy’s DJ FX’s opens a new range of musical possibilities allowing you to achieve the (hardware) pro tricks in perfect sync. Beat & tempo detection : Elephantcandy’s sophisticated song analysis calculates the beats per minute (BPM) and more than that! The exact location of each beat is found with precision. These features lay the groundwork for a host of other features including Auto-Sync and beat-synchronized looping. Visual mixing with waveforms : Sound is not everything… a detailed and interactive audio waveform display allows you to visually cue to specific points to prepare the perfect transition. Mixer and EQ controls : 3-band equalizers, gain, line faders, and a crossfader give you all the tools you need in a DJ setup to seamlessly blend one song into another. Cue Points & LoopingContinuously repeat part of a song as a stunning live effect, or remix on-the-fly by mashing up loops in perfect sync with the beats. FX’s : Stutter, a fun effect where the beats are played in a different order. TapDelay, you have to hear it to understand the power of this effect. Together with the beat analysis we mix a perfectly synched delay effect into your sound. SRBC-Filter, the beat will continue but the sound is reversed per beat. This is the “can’t live without” module! All well known sound effects are brought together in a, easy to plug in, library. Spatialize your sound with dynamic reverb and delay. Warm, cold, tiny or stadium like audio on the fly! The versatile controls make this module also very powerful for game development, adding richness and realism to the sound experience. Many features can be extracted from sound and music, ranging from signal level features such as pitch estimation and and timbral pattern matching to more musical ones like tempo analysis and key estimation and even social ones like music recommendation. These analyses open a wealth of possibilities. Some applications are more obvious, like using pitch estimation for a tuner or beat estimation for tempo synchronisation, but how about controlling a game avatar through singing, or using an analysis of environmental noise to suggest a next song? At elephantcandy we know not just the science behind state of the art analysis algorithms, we excel at implementing them on low-powered devices such as mobile phones and tablets. Spectrum Analysis or FFT transformation converts an audio waveform into its spectral components. This forms not only the basis for sound visualization, but also provides insight into the sound quality, noise level, spectral balance and spatial distribution. Elephantcandy’s Spectrum Analysis module is fast and extremely easy to use, and opens the door to a wealth of creative possibilities. Check out this app to see this module at work! With state-of-the-art accuracy and impressive speed, this module performs real-time pitch extraction from audio signals. With this module it is easy to do pitch tracking on vocals or create tuners. We have succeeded to optimize the calculations in such a way that even an iPhone 3G is capable of doing the realtime analysis. In our application PerfectTune you can see the module at work. While great sound is ofcourse essential to musical applications, just about any application can benefit greatly from a sophisticated use of music and sound. Our frameworks make it easy to add an advanced audio infrastructure to a program, with components such as a sequencer, a vector optimized DSP chain, integer and floating point processing. Play and process files from the local iPod library, the local sandbox or the net. Flexible audio routing, using the device’s microphone, line-in and out or USB audio devices, as well as AirPlay to connect to external televisions and stereosets. Script a soundtrack to your game or story with our sequencer, sampleplayer and synthesizers. Instead of a statically looping soundfile, a sequenced music track can adapt itself to the current point in your storyboard, adding life and dynamics to the sound environment. Trigger sounds from samples, or generate them using one of our synthesizers. Connect and control devices via OSC or MIDI. Elephantcandy understands the power of the mobile device in connection with hard ware. With this module you are able to make any kind of remote control from your iPhone or iPad. The elephantcandy sequencer is a complete sequencing engine, with multi track recording, editing and playback facilities, for digital audio as well as MIDI. And it is all optimized for mobile devices. Elephantcandy’s sequencer is the base for any complete mobile multitrack virtual studio, but can also be used to add interactive music and soundscapes to apps and games. Can’t you find what you need? We are always working on new stuff. So there is big chance we already made a start with what you are looking for. Give us a call for more information. If you like we can also develop code specially for you. Every SDK-delivery comes with an trial period of 2 weeks. During this period you may terminate the License Agreement without any further financial obligations. For every SDK-delivery you can count on our outstanding full integration support.